For every player who enjoys a long and successful Test career, there is another who fades away after a promising start. 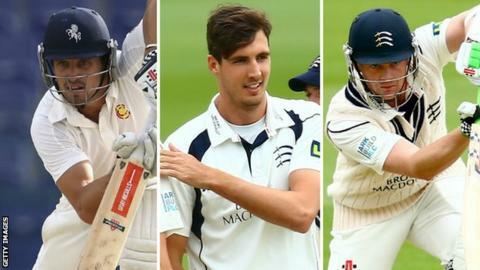 Middlesex team-mates Nick Compton, Steven Finn and Sam Robson could all be said to fall into the latter category. Dropped for a dip in form, technical failings or the emergence of other players, they all want another taste of life at the top. Compton and Finn have not featured for the Test side since 2013 while Robson played seven times last summer but was omitted from the squad to tour the West Indies. Here the trio - who all have a constant reminder of playing at a Test match ground when they walk out at Lord's - speak to BBC London 94.9 about their hunger to return to the England set-up, with an Ashes summer on the way and the performances of several current Test players under scrutiny. Compton broke into the England set-up after a prolific domestic season with Somerset in 2012. He scored two centuries in nine matches but has not played since the second Test against New Zealand in May 2013 - when he scored one and seven in his two innings. He left Somerset over the winter to rejoin Middlesex. "I wouldn't say [being dropped] was out of nowhere but perhaps you go through a bit of a tough patch for a couple of weeks and then it suddenly ends. "It is a tough thing to go through, come to terms with, dust yourself down and let go of, in a way. I have always wanted to be an international cricketer and dreamt about playing in an Ashes series. "I am 31 but still feel I am in my prime and still feel there are a few more runs in these legs. "Now it is about business. The fantasy does go away and it is time to get myself together. "I need some sort of motivation. Every player has a way of getting themselves going and for me, as the number of runs goes up, that drive, hunger and deep ambition comes back." Compton scored three and 85 in Middlesex's draw with Nottinghamshire in their first County Championship game of the season, and then made 28 and four in the win over Somerset. Finn became an England regular after his Test debut in Bangladesh in 2010, but fell out of favour during the Ashes tour to Australia in winter 2013-14. The 26-year-old was sent home to "work on technical aspects of his game" - and collected 48 Championship wickets last season at an average of 30.72. Finn played four matches for England at the World Cup earlier this year, taking eight wickets. "I'm always desperate to hit the ground running but maybe more so this year to prove a point. "The most important thing for me is the feeling of bowling well. Sometimes you can get wickets but it doesn't feel right. "If the wickets don't come I can still be content if I feel I am bowling well and I am putting the balls in the right area. "I think I'm back to being normal. Last year was finding my feet and getting back out there on the pitch. There were never any big issues or demons but it was important I enjoyed getting back to playing cricket. "There are guys ahead of me in the pecking order and they deserve to be there as they have been more consistent than me over the last 18 months to two years. "It is up to me to try and work my way back up." Finn has taken seven wickets at an average of 34.85 in Middlesex's first two matches of the Championship season, with his best bowling figures of 3-66 coming in the second innings against Somerset. Robson played all seven of England's Tests last summer after an impressing for Middlesex and England Lions, hitting 127 on his second Test appearances against Sri Lanka. The 25-year-old played for the Lions again over the winter, but was overlooked for the tour of the West Indies, with Jonathan Trott returning to the side. "Last summer, being in the Test side and being around the main squad was a great experience. "I loved every minute of being in the side and felt I had some success. I would have liked another score later on in the summer but it wasn't to be. "I enjoyed working with everyone in the set-up and the team. I'd love to get back in there at the moment but I don't think you can look that far ahead. "It was beneficial six or seven weeks in December and January [with the Lions], with mixed results. I probably didn't get as many runs in the few innings I had in the proper 'A' games. "[Wanting to get back in the side] goes for everyone. I was obviously disappointed to be left out for the tour of the West Indies. "I am trying to move on and improve as a player. That is all you can do." Robson is still looking for his first big knock of 2015, having scored just 55 runs at an average of 13.75 runs in his first two Championship appearances this year. Interviews by BBC London 94.9's Kevin Hand.